Mod: I've been writing columns for the Sierra Madre Weekly, which also run in its sister paper the Pasadena Independent. Here is what appeared there this week. The Night Sierra Madre's Civility Party Died (link): Once upon a time there was a slate of candidates who ran for Sierra Madre City Council seats that called themselves "The Civility Party." They claimed to be much nicer and more polite than the other candidates, and a lot of people bought into that. Then, in November of 2014, all of it blew up, and in truly spectacular fashion. I am not sure anyone had ever made such a journey before. To go from being this city's Mayor to by far its most egregious and frankly cracked offender at public comment, and in just a relative few months, was a pretty dramatic trip. I had never seen this kind of thing happen to any other Mayors in the area. Yet here in Sierra Madre the person who had been The Civility Party's spokeswoman and Mayor, for whatever the reason, went deep and very dark. 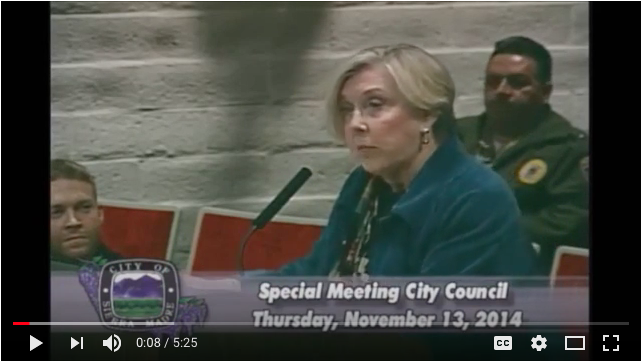 Nancy Walsh's disturbing and profanity laced address to the City Council on November 13 of 2014 was a radical departure. Yet only a relative few actually saw her say any of those things at the time. However, on YouTube the video of her speech has been viewed thousands of times, and all across the country. At the top of this article I have posted a link so you can see it all for yourself. To call her use of the words "child predator" as a metaphor to describe the actions of certain elected officials interested in governmental reform "inappropriate" hardly does justice to that somewhat fussy word. That she should then go on to cite these officials by name, and in this very same ugly and disparaging context, was not the act of a civil, or even reasonable, person. Many of the people I discussed this with at the time believed what she said that evening represented actionable libel, and should two City Councilmembers have decided to take former Mayor Walsh to court over what she said in this video, they probably would have won. It also begged this question: Whatever happened to the Civility Party? Perhaps Nancy's fellow members, John Buchanan, Josh Moran and Joe Mosca, might have wanted to share their views about this. Clearly her talk did not reflect well on those who had supported and elected her to office in 2010. And after all, this woman really was elected to the City Council. People believed they were voting for her because she represented a kinder and gentler way of doing political business in town. Clearly that had all gone out the window. It was the night Sierra Madre's Civility Party died. It has never been heard from since. Ha, the Civility party has just moved underground, so to speak. The supporters are out there, same grumbling along with more poor city planning. The Civility members are more spread throughout the various city organizations. Fondly, the Civility group was dubbed "The Dirts". The Cumquat website died; yes the pun is intential, and resident Fay Angus was the recipient of the foul writer and his followers. That video is a stark reminder of the kind of madness we have escaped. The current City Council truly is civil, as opposed to those who want to go back to the bad old days. I watched the video to remind myself what an uncivil group this person represented. She is so intimidating that her neighbors are afraid to put out election signs for fear of upsetting her. When you look back at Mrs. Welsh and her supporters you see the people who orchestrated the city into the problems that cost us a lot of money. We tax payers are lucky that with the new city manager and present council they have saved the city from several financial disasters caused by that group. No, I didn't misspell her name, just check the dictionary for confirmation. It scares me to think that this group encouraged and supports Andy in this election. We can only hope the voters see the truth. In yesterdays mail we received a brochure from Andy supporting keeping the Library where it is. Wasn't he the one who promoted moving the Library to the YAC? Also, isn't he supported by Nancy Walsh's uncivil group? Andy has flip-flopped on the Library? Do tell. Arcadia Andy will say anything to get elected. As inauthentic a person as you will ever meet. Andy is the one who gave then Library Director a quote of $2 M to sell off the property. Sadly, quite a few people have bought into his "let's save the library." She simply lost her marbles. But they haven't gone away. They are lying dormant like a malaria virus ready to rise again. Their standard bearer is now Andy Benscome. That's why he must be defeated. She's nuts and to think she was once in the City Counsel. 6:46, you wanted to say Welch, right? Mean as a snake, that lady. That lady in the video is a tad bit of a whackado. There’s a good chance she is related to Tay. Completely insane. The phrase comes from an American television commercial for a breakfast cereal. The phrase comes from the cereal's mascot, a bird that went crazy for the taste of the cereal. Thus "Kookoo for Cocoa Puffs" became synonomous in American pop-culture for someone who was mentally unhinged. Love that “mentally unhinged”. I’m going to start using that phrase. Thanks for the post. Is there a state of the city talk today? 10 AM at the Hart House. Mayor Arizmendi gives state of city talk. Sholan Tay and Chandler are desperate to remain on council, resorting to non stop lies, both are severely mentally unhinged. Walsh is the type of woman that tries to pull and drag other women down. It's no wonder we never see her around town. I was on the General Plan Update Steering Committee. Chairperson, Delmar would call on her, asking for her input, but she would be busy looking at her phone and not paying any attention to what was going on in the meeting. Denise asked several times if our committee could be televised, and was told that it was impossible. This committee saved the City over $250,000...that's what Chairperson Delmar's leadership did. Please give to her campaign, and make sure we elect someone with Sierra Madre's best interests at heart, not Andy, who is funded by the Arcadia Board of Realtors. Here is a question that needs to be asked. Did somebody leak the results of the Library Survey cards to Andy? That information has not been released yet. But if he knew it would give him a political advantage. He could claim to be on the winning side before anybody knows the results. Interesting. Maybe the Mayor is going to talk about those results at her little talk today. Wouldn't that be a coincidence? I'd heard that Benscome led the "Move the Library" cheer group at the Community Service Commission. Then again, the notorious Joe Mosca was on tape, lying, "adapting," and he still won re-election. People want to believe the nice things they hear, not the un-nice ones. 8:12am. The city could use a forensic audit, the Library won't move. If the City can't afford a forensic audit then the City can not pick up any expense on Library move. Common sense, but this current city council was not able to make this determination. Love the distraction, but wasn't it these survey cards that were going to determine how the Library question was going to be decided? The newly hired City Manager is why finicial disasters have been avoided. Really? That is not what we've been told by City Hall. The City Council will ask Consultants to make a determination on the affordably of keeping the Library right where it sits. Remember how Karma Bell told all those lies about Nancy Schollenberger - "She doesn't keep office hours at City Hall." Well, yeah, she doesn't need to, just call her and she will meet you, and on and on. Same Walsh crowd is pulling Benscombe's strings. Nancy Walsh and Bart Doyle were besties. Not so FUNNY is the fact when Scary Nancy's group was running the city a Forensic Audit was requested and turned down immediately on financial grounds. We still need that audit. It was Buchanan we have to thank for closing the door on that. Sierra Madre has been dormant these last few year's, not much happening. The "rats" have jumped ship with the ginornmous retirement packages from CALPERS. That alone signals the City is having difficulty staying afloat. Without the UUT all is lost, or so this council all agreed in the newest mailer. But I ask, what was the cost of that mailer and why is this council wasting tax payers dollars for their opinions. The city has not been dormant. The current council has gotten rid of an incompetent city manager, hired a new one who is proving to be efficient and concerned with transparency, the council saved us one million dollars through administrative reorganization, is focused on bringing codes into line with the General Plan, and has put in place a long range infrastructure repair plan. The other side has been organizing and grooming Benscome, supplying him with funds from everyplace but Sierra Madre. His campaign is not spontaneous or motivated by his love for the town. He is a reincarnation of the Civility Party. the No on Measure D mailer is paid for by a political committee...not "tax payers" (sic) dollars"
Where is their dough coming from? Certain unsavory elements lurking in the shadows of Sierra Madre, California have secretly undermined ALL efforts to right this ship and make it profitable for themselves ONLY. Thus making the majority of voting residents slaves to a screwed up City Hall and those backwards thinking City Council Members in 2018. I remember crashing Nancy Walsh’s campaign kick-off party for Noah Green. Even there she seemed grumpy and arrogant. She was talking to Susan Henderson, who Green’s wife called the ‘unofficial mayor’ of Sierra Madre. Weird. At least the crudité was decent. I tried to watch that video of Walsh flipping out, but really, it brings back too many bad memories, and her craziness is painful to see. One of the Civility Party's most irritating tricks, often used, was to accuse others of what they themselves were doing - a kind of reverse mud slinging. Andy will say anything to be elected. What a look into his empty soul. There is an increasingly nasty whisper campaign to replace Delmar with Jose Andres Bencosme because Delmar is considered too close to this blog and the usual suspects who have been identified as blog supporters. Yeah. The usual lying Realtors with nothing more to do except sit in empty offices staring at computer screens. Bitter old gals who think they've been cheated out of big commissions because certain of their clientele can't build McMansions here. 12:45 - you need to ask Noah Green about your theory. Arizmendi is the one that Benscome will replace, so say the whispers. The whispers come from asses. Flip Flop Andy is politically dead in the water. Mr. Robert De Pietro is a Partner at De Pietro Holdings LLC, a real estate investment company based in Los Angeles that currently owns more than 545,000 square feet of office, medical office, industrial, and retail properties in the greater Southern California, Phoenix, and Denver areas, and more than 30 acres of developable land in California. As part of senior management, Mr. De Pietro oversees the daily operations of the company with a focus on building engineering, asset management, construction & renovation. Robert also oversees property management of the company’s portfolio, including leasing activity, contracted services, building operations and property maintenance & renovations. Mr. De Pietro holds a Master of Science degree in Structural Engineering and Structural Mechanics from the University of California, Berkeley, a Bachelor of Science Degree in Engineering from Harvey Mudd College, and attended Loyola High School in Los Angeles. De Pietro served as a Public Member & Past President of the California Architects Board, is currently a member of its Regulatory and Enforcement Committee, is a member of the Structural Engineers Association of Southern California, and is a past member of the National Council of Architectural Registration Board’s Professional Conduct Committee. He also serves on the Harvey Mudd College Alumni Board of Governors and is a former member of the Harvey Mudd College Board of Trustees. In addition, he serves on the Boards of the Eagle Rock Chamber of Commerce as Treasurer, the Ferrari Owners Club as Secretary, the Patrons of Italian Culture as Secretary, the Foundation Board of Glendale Adventist medical Center as Secretary, the Boards of the Historic Italian Hall Foundation, and the L.A. Railroad Heritage Foundation, the South Lake Business Association and is Chair of its Streetscape Committee. Mr. De Pietro is a member of the Jonathan Club of Los Angeles, the Italian Catholic Federation, the Garibaldina Society of Los Angeles and the Kiwanis Club of Eagle Rock. He is a supporter of Hillsdale College, the Claremont Institute, the Heritage Foundation and Saint Monica Academy in Montrose, California. Civility is dead ? Thats Deplorable! Civility committed suicide. Now all we have are commission only zombies. 2:00pm. Clearly you are searching for meaning to your rant; California has declared the Italian Christopher Columbus day as Indigenous People day. You may send your tax deduction contributions to your nearest Tribal Council, make amends for your ancestors massive land grab. Couldn’t I just lose a few games at San Manuel Casino and call it even? Can someone please start an effort to collect and return all of Chandlers latest mailure and dump them on his porch ? Wouldn’t that send a great message. I volunteer to collect and deliver but not sure how to go about it. This applies to those that haven’t already burned them. I would contribute all I have received but didn't know and used them as doggie waste scopers. Sorry. Is the Chandler family from Arcadia any relations to the L.A. Times Newspaper Chandler family? If they are, it's a distant connection.